We heard it quite frequently mentioned last quarter in restaurant earnings calls: the effect of weather. Any restaurant veteran knows it matters, but how much and over what period of time? Weather does matter, but it impacts unequally and sometimes in short bursts. Research says that retail spending is positively influenced by sunlight, lower humidity, higher barometric pressure and higher temperatures. 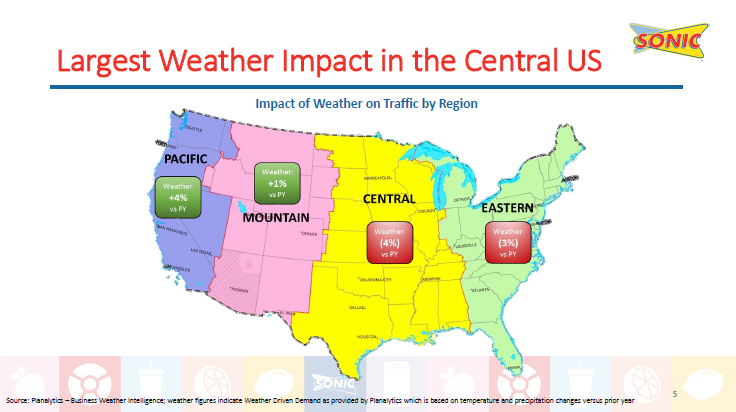 2.3% of retail sales levels are said to be influenced by weather. One alternative now present is online sales, which jumps during bad weather, which can be both good and bad for restaurants. Bad weather can shut down virtually outside all human activity. Other than running out of food at home, we know there is no biological survival imperative to eat at restaurants; it is typically both impulse and planned occasion driven in nature, with both kitchen replacement and social/entertainment as prime motivations. But it represents superior convenience and positive for socialization. Over the last several decades, the ratio of food spent away from home has surpassed food spending at home. That is great for us; the problem is that spending is spread over more and more establishments in the US. 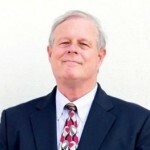 An international QSR operator with a mix of both hot and cold beverage sales mix has noted in the past that it the US has been too hot in the winter and too rainy or cooler in the spring or summer months. One winter there was a stretch of 60-degree highs in the northeast that was considered “too hot”. This was said that despite the mix of beverages; now the menu mix is so balanced that a drink for any kind of weather is obtainable, and that virtually all of their sales came from the pre-lunch period, when temperatures were cooler in the day. Business can’t be both ritualistic and impulsive at the same time. From my own review of store sales numbers, restaurant concepts with primarily a cold drink base (think, Jamba Juice (JMBA) and the ice cream and yogurt players) have a legitimate weather gripe. For example, the Jamba unit at Boston Logan Airport will be busy even early in the day but a walkup Jamba Juice unit in Honolulu will struggle to get traffic on a windy, cooler winter day. Their menus are so limited that there is no weather alternative. Casual dining operators with outdoor patios can be affected by either too hot or too cold weather as both conditions have noted in the past. Other casual diners might be positively impacted from bad weather in that poor weather cuts down on other options and it becomes a great use of time to go to an eatertainment venue such as Dave and Buster’s (DAVE), as an example. During one of the frequent snow and cold snaps in the northeast this year, CNBC interviewed a steakhouse operator within walking district of the Financial District in Manhattan. His weather analysis was that when the daytime high was around 20 degrees or less, or if there was snowfall, that was the “kill business” zone. Dominos ‘s has noted they vastly prefer rain and snow and national distractions where people might cluster at home. Casual diners might prefer a summer rain but not a winter rain. There are several good weather analytics firms, such as Planalytics, The Weather Channel and more. I’d suggest that restaurant prediction models be more calibrated over time to account for the presence of drive-thrus, delivery, dense urban/CBD walk-in store mix (that is more impacted by the potential to walk in) and menu diversity as explanative factors. Restaurant executives on the spot to explain what has happened in and why should be wary to overuse the weather factor. After all, almost all of the comparisons are versus prior year, and weather happens and is embedded in early month’s results. Unlike the retail demand for a winter coat, restaurant desire is more evenly spaced. Too much mention of weather blends in with empty earnings call words such as “it performed up to our expectations” and “we’ll make our projection via second half of year excessive performance”. The Effect of Weather on Consumer Spending, Journal of Retailing, 2010, No. 17, 512-520. Weathernomics, The Weather Channel, 2015.